The splake or slake (Salve-linus namaeycush X Salvelinus fontinalis) is a fish. It is the hybrid of a male brook trout (Salvelinus fontinalis) and a female lake trout (Salvelinus namaycush). The name is a combination of speckled trout (another name for brook trout) and lake trout. The name may have been used as early as the 1880s. 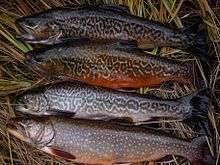 Hybrids of the male lake trout with the female brook trout (the so-called "brookinaw") have also been produced, but are not as successful. ↑ Kerr, S. J. (2000): F1 Splake: An Annotated Bibliography and Literature Review. Fish and Wildlife Branch, Ontario Ministry of Natural Resources, Peterborough, Ontario. 79p. + appendices. ↑ Sowards, C. L. 1959. Experiments in hybridizing several species of trout. Progressive Fish Culturist 21(4) : 147-150. This page was last changed on 5 October 2014, at 07:15.